Announcement Original beading instructions by Norma Jean in an easy to learn format! New to ETSY? Here is the "how-to" link on purchasing an item - It's Easy! 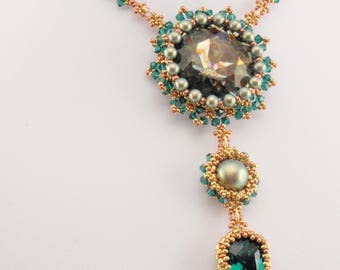 Original beading instructions by Norma Jean in an easy to learn format! This is my tester's(Sam Macklem) version of Starmie! Beautiful! 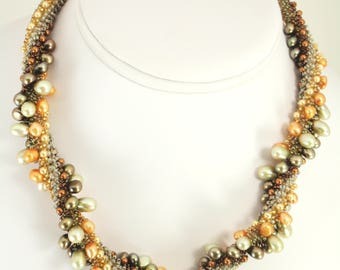 Introducing a new tutorial using the RounDuo beads from Potomac! Everything in my shop is 20 percent off starting now till 3/14/16. Just use the code birthdaybash. Happy beading! Enjoy! When I get bored or stuck on a problem with one project, I move on to another! This is my work space in my studio! As you can see I have lots of projects going at the same time! Here are a couple more projects! 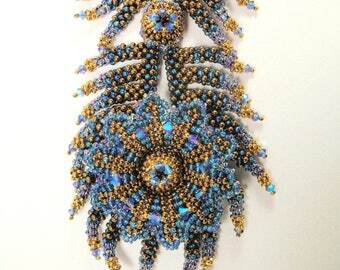 I love to create new beading designs! Hi! I am a beadweaver. Yes, one of those 'one tiny bead at a time' people! I love it! I did not start out as a beadweaver. I was a kindergarten teacher in my former life but fell into beadweaving when my family relocated. I started learning beadweaving techniques in August of '08. I quickly became engrossed with all the possibilities. I am continually looking for new techniques, while practicing and developing the ones I know. I love to create original works, especially, because they are very challenging and require a lot of thought and problem solving. Sometimes they start out as one idea and evolve into something quite different. Playing with beads...that's me!!! I am a beadweaving designer! I love creating with beads! Most of my life, I worked as a kindergarten teacher. When one reads my tutorials, one will see that they are written for teaching. I teach at some bead shops and truly enjoy my students!!! · Service providers. I engage certain trusted third parties to perform functions and provide services to my shop, such as PayPal. I will share your personal information with these third parties, but only to the extent necessary to perform these services.